POSTED September 13, 2018 11:33 a.m.
SOUTH WAYNE — Black Hawk’s has put its Six Rivers title defense in the hands of its defense, and the Warriors’ D has come through with flying colors. 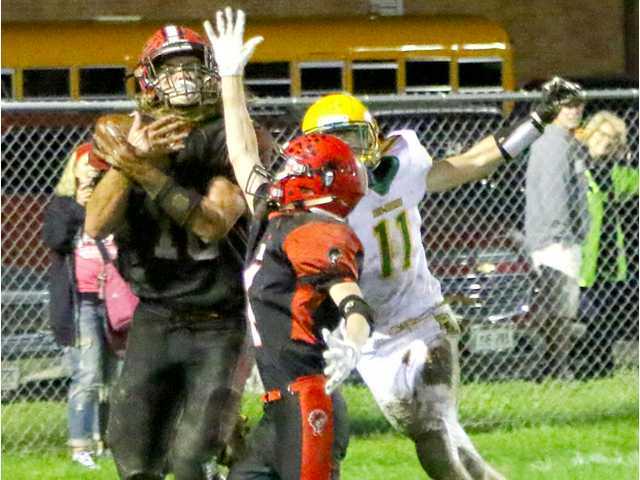 The Warriors throttled a high-scoring, state-ranked foe for a second straight game, sinking the visiting Pecatonica/Argyle Vikings, 8-6, in a muddy quagmire of field conditions at Murphy Field on Friday, Sept. 7. The Warriors, who came into the night ranked #3 in Division 7 in the latest Wissports.net Coaches Poll, improved to 3-0 overall on the season and 2-0 in the Six Rivers Conference after taking down the previously unbeaten Vikings (3-1, 2-1), who were ranked #6 in Division 6. Black Hawk found the end zone first late in the first quarter when senior tight end Rece Shelton hauled in a 7-yard touchdown pass from senior quarterback Kyle Lovelace. The Warriors lined up for the two-point conversion, like always; and, following penalties by each time on the first two tries, the third time proved to be the charm as senior running back Colby Argall punched it in on the ground for an 8-0 lead with 48 seconds remaining in the opening quarter. The Vikings responded right back with a scoring drive of their own, marching 70 yards to pay dirt on 15 plays to cut the deficit to 8-6. Quarterback Colton Schaepfer capped the seven and a half minute trek by hitting Jaden Hendrickson with a 19-yard scoring strike. The Warriors stuffed the conversion attempt the hang onto their lead. Then, Coach Milz put the game into the hands of his stout defense, which put a wall up in the red zone the final 29 minutes of play. With the conditions deteriorating into a sloppy, muddy messy, neither team could sustain a consistent drive. The score was deadlocked at 8-6 at the halftime intermission, and it remained stuck there the entire second half. “It was about staying disciplined on the line and cancelling off all the inside gaps so there are no lanes for cutbacks. When we got out of position, Pec made us pay. We both had a hard time making cuts and getting north and south on a muddy, sloppy field, but that probably played into our favor a little bit, too,” admitted Milz. The Warriors used a pair of third-down quarterback sacks to force punts on two of the Vikings’ four second-half possessions. Shelton also came up with an interception in the end zone– his second pick of the game– to halt a potentially go-ahead score, and the Warriors caught a huge break when a wide-open Mitch Flannery dropped a well-called fake punt pass to thwart another potentially score. Black Hawk didn’t fare much better on offense in the second half, turning the ball over twice and gaining less than 50 yards over their first four drives of the half. However, when it mattered the most, the Warriors were able to come up with the plays they needed to seal the win. A 37-yard run by Argall down to the PA 9-yard line with under two minutes remaining allowed the hosts to run out the game clock. The Warriors outgained the Vikings on the night, 239-156, including slight edges on both the ground, 153-89, and through the air, 86-67. Argall ran 19 times for 129 yards to lead the Warriors, while Lovelace finished 6-of-11 passing for 86 yards with a score. Shelton hauled in three catches for 29 yards and a TD, and led the defensive unit with 15 total tackles and two interceptions. Senior Mitchell Quinn also racked up 15 tackles with Gunner Foecking adding nine stops and half a sack and Lovelace recording seven stops. Hunter Bredeson also had a sack and Nick Whitcomb chipped in to join Foecking on a sack. Schaepfer went 6-of-15 passing for 67 yards with a TD and two interceptions, and he rushed 16 times for a team-high 49 yards. Hendrickson had three catches for 37 yards and a TD. The Warriors heads to Benton’s Swift Park for a Six Rivers clash with Benton/Scales Mound (2-2, 2-2) on Friday, Sept. 14, at 7 p.m. Team Stats: First Downs – PA 8; BH 8. Rushing – PA 30-89; BH 32-156. Passing – PA 6-15-2, 67; BH 6-12-1, 86. Fumbles-Lost –PA 0-0; BH 1-1. Penalties – PA 8-63; BH 10-82. BH Individual Leaders: Rushing (Att-Yds-Td) ­– Colby Argall, 19-129-0. Passing (Comp-Att-Int-Td-Yds) – Kyle Lovelace, 6-11-0-1, 86. Receiving (Cat-Yds-Td)– Tyler Triem 1-38-0; Rece Shelton, 3-29-1.